Like most, the temples were my main reason to come to Siem Reap. I decided to rent a bike to explore freely the ruins, up to this day I’m still not sure if it was a good or bad decision. Being in Cambodia at the hottest time of the years, biking proved to be challenging despite being rewarding. It felt like I just couldn’t drink enough water to compensate for what I was losing. Also, some of the temples are quite far, as in 40 km away, so if you plan on seeing those ones you might want a driver. I know tuk-tuks hire out for 20$ to visit the temples, but I think they only cover the temples I have done not the faraway ones. You might want to hire out an actual driver with a car if you plan on seeing those. Other tidbits of information to help you plan your visit: the entrance fee for one day is US$ 20 while you can get a ticket for three consecutive days for US$ 40 and for 7 consecutive days for US$ 60. Visiting hours are 5:00 AM to 6:00 PM. Your ticket will be checked anytime you try to go to a main temple, so always have it with you. Also, they don’t have debit machines or ATM machines on site. Bring the right amount of money. If you don’t, don’t let the guys tell you you have to go back to the city to get money. They don’t care. Let me tell you, after about a 2-5 minutes bicycle ride, you will see a sort of mall on your left. Look there, there should be an ATM machine and it is well indicated. I went all the way back to the city on my bike and only saw this on my way back. I was not impressed. Which brings me to an incident I feel I should share with you. One thing I noticed here, is that people who don’t normally deal with tourists are the kindest you can imagine. Now, the bigger the tourist attraction, the rudest the staff. This made the staff of the temple complex among the rudest I have encountered in all my years of travel. Here, I had my first taste of rude at the Royal Palace of Phnom Penh. That had not fully prepared me for the behavior I would encounter at the ticket office of the temple complex. After biking all the way back to the city in the heat, I felt I should inform them that there is an ATM a mere 2 minutes away, so that they would not send tourists all the way back to the city anymore. Now, I’ve replayed the events back in my head and I am 100% sure I was not threatening, aggressive or in any way rude. The man started screaming at me and getting really aggressive, to the point I was the one that had to politely ask him to please calm down. Eventually, when I saw that I couldn’t reason with him and that he was not about to stop screaming, I just walked away. Later I looked for a place to lodge a complaint, but I’m sure it will come to you as no surprise that there is no such mechanism in place. If you want to enjoy your time in the complex, deal with the staff as little as possible. 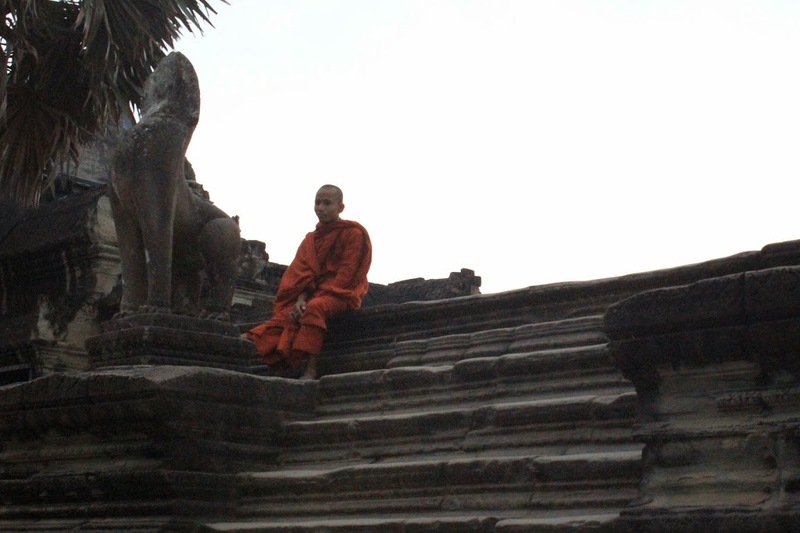 Angkor is one of the main archeological sites of South East Asia. Spreading over 400 km2 and partly covered by forests, this archeological park boasts exceptional ruins of the previous seats of the Khmer Empire when it was at its peak between the IXth and the XVth centuries. 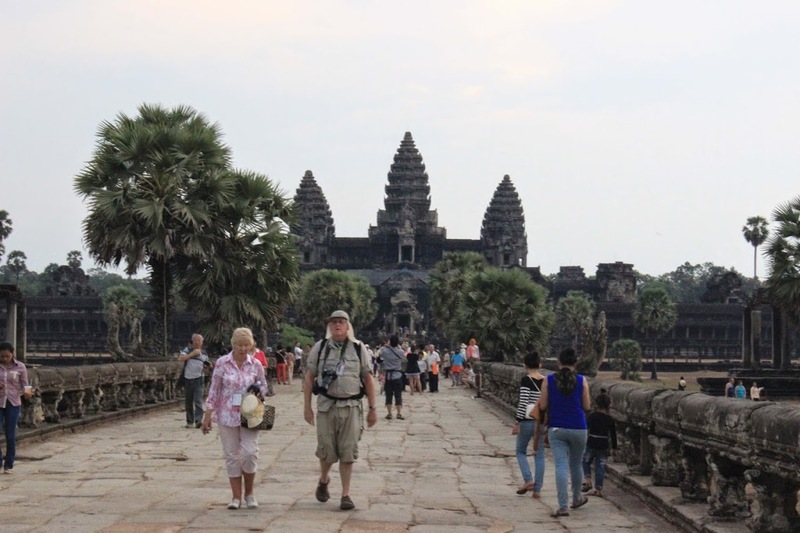 This includes the well known Angkor Wat temple and the royal city of Angkor Thom. Angkor Wat is probably the best known temple of the complex. It was a finalist for the New 7 Wonders of the world, but didn’t actually make it to the official list. It is the largest temple of the complex and it is best viewed at sunset. It is thought to be a representation of the cosmic world. The central tower rising from the center of the monument symbolize the mythical mountain, Meru, situated at the center of the universe. The five towers stand for the peaks of Meru. The outer wall corresponds to the mountains at the edge of the world, and the surrounding moat the oceans beyond. Cosmic representations seem to be a recurrent theme in most of the temples. Angkor Thom was the last capital of the Khmer Empire and was a fortified city enclosing residences of priest, officials and military, as well as administrative buildings. These structures were made of wood and have rotten away. A causeway leading to the entry tower is flanked by two row of 54 stone figures. This would be 54 demons on the right and 54 gods on the left, resulting in a total of 108 mythical beings guarding the city. The demons have a grimacing expression and wear military headdresses while the gods look serene and wear conical headdresses. The Bayon was definitely a favorite of mine. It is located in the center of Angkor Thom, about 1,500 m from the South gate.There you will see over 2000 faces carved on 54 tower. “The faces with slightly curving lips, eyes placed in shadow by the lowered lids utter not a word and yet force you to guess much” (P Jennerat de Beerski, in the 1920s). It is generally accepted that the four faces on each of the tower are images of the bodhisattva Avalokitesvara and that they signify the omnipresence of the king. 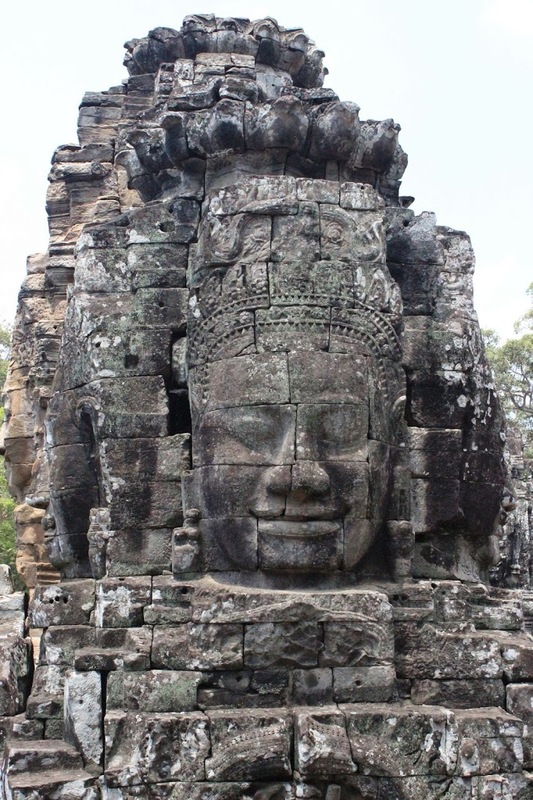 The characteristics of this faces – a broad forehead, downcast eyes, wild nostrils, thick lips with a slight curl upwards at the ends – make up the famous ‘Smile of Angkor’. It is thought that the message behind the eternal smile of Angkor is that by smiling people bring happiness to each other, which allows them to become closer to the gods. This being said, not all faces appear to be smiling, some appears impassive while others look sad. 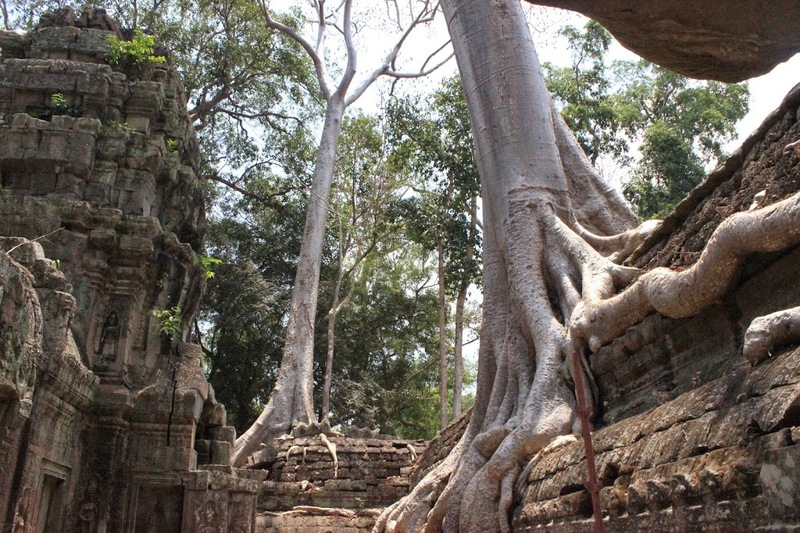 My number one favorite temple was Ta Prohm, the Jungle Temple. 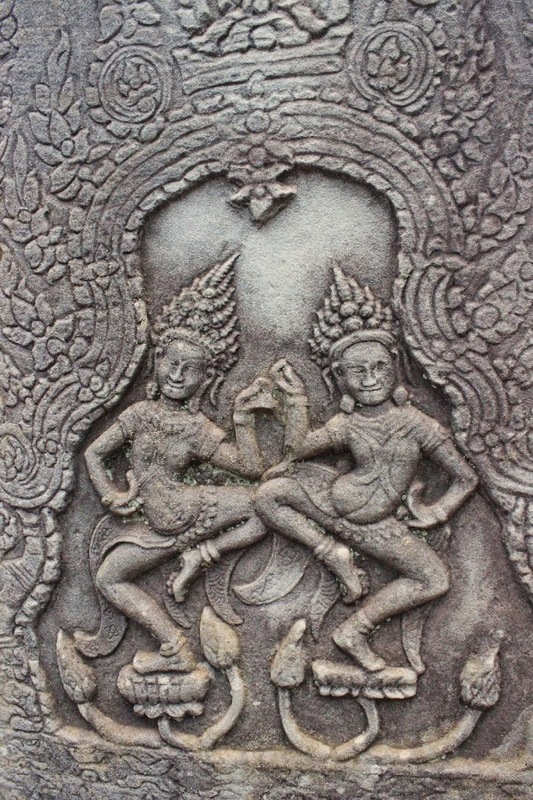 It is located southwest of the East Mebon and east of Angkor Thom. One small reason to like it: it was a lot less touristy than its Angkor Wat counterpart. 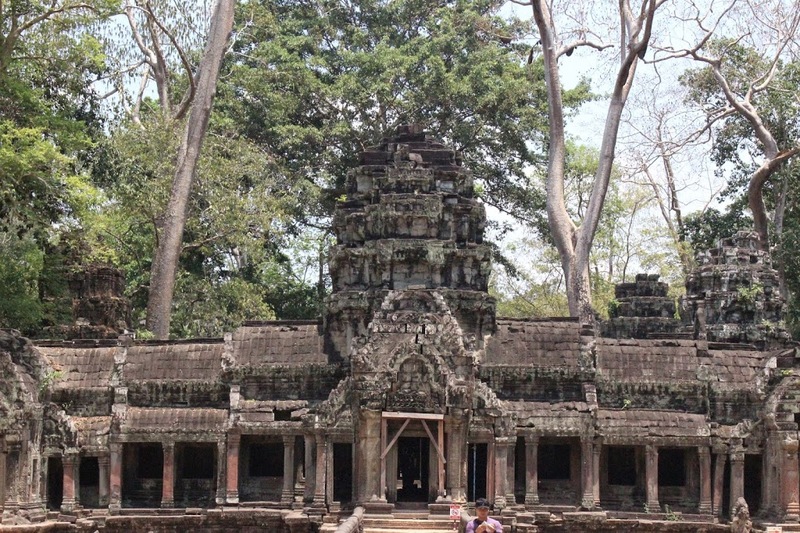 More secluded and reclaimed by nature, this temple will really bring out the Indiana Jones in you. This my utter favorite because of the atmosphere of the place, the big trees with their roots seeping in the structures really give it an oppressing feeling. Although, I’m not sure this is the right word, but I’m not sure peaceful is as well. Other words that come to mind are eerie and contemplative. This is a place where I could have done meditation, if only I knew how to stop the racing of my thoughts. While it doesn’t necessarily have the architectural and art elements of some of the other temples, by having less it somehow exercised a stronger attraction on me. I think, for me, it mostly served as a reminder that time erodes everything. Now I only wrote about the temples that spoke to me, but there are many others, some just piles of rubble. There is so much you can learn about the temples and there is just so much I can say here. If you plan on visiting the temple complex or if you want to learn more, I would advise you visit this website which will give you lots of information about the different temples. It goes in depth into the subjects of art, architecture, symbolism, etc. I also recommend watching this short video by the National Geographic and reading this article to get inspired for your visit.